The vast red desert domain of Arena sprawls south and westward from the nurturing plains of Penance. Spurred onward by the ancient promise of gold buried beneath the sands, massive armies of brutal warriors rumble across the scarred and wasted terrain. For the fortunate few, the ultimate dream of Arena still comes true - immeasurable riches, supreme command, and decades of extravagant and luxurious living atop the Queen's pedestal of peasure. For most however, whatever dreams they may harbour are soundly crushed under years of backbreaking labour, constant battle, exhausting marches, gruesome butchery, and an infinity of accursed crimson sand. 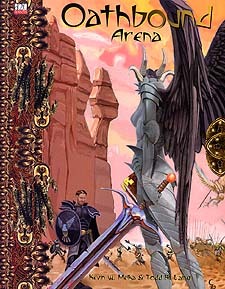 Oathbound: Arena provides a new entry point into the world of the Forge. This is the Domain of Barbello, the Mask of Fury,the invincible mistress of rage, pain, warfare, and death. Who amongst you can withstand her test? Requires the use of Dungeons & Dragons Player's Handbook, Third Edition. The Core campaign book, Oathbound: Domains of the Forge, is also highy recommended.